"APPROVED BY MINISTRY OF RAILWAY, GOVT. OF INDIA FOR SUPPLY OF BATTERY TO INDIAN RAILWAY"
PROMOTER & FOUNDER Late Dr. R. P. Shirodker, the promoter and founder of the company, was a well known Battery Technologist with more than 35 years experience in battery technology both abroad and in India. Dr. R. P. Shirodker held a Ph.D in Chemistry from Munster University, Germany and had worked as Head of R & D in Varta Batterie AG, Germany for more than 8 years. He held a number of Patents to his credit in Battery technology and had presented numerous papers at International conferences on Battery Technology. He was the recipient of several National Awards including the National Award for Quality Product 1987 from the President of India so also the Manager of the Year Award 1998 from Goa Management Association. He has also promoted sister concern M/s. Germania Batteries Pvt. 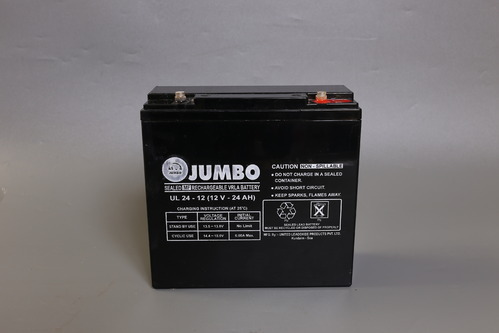 Ltd. for the manufacture Automotive & Motorcycle Batteries. MANUFACTURING INFRASTRUCTURE The factory located at Kundaim Industrial Estate, Kundaim - Goa is equipped with the latest machinery & equipment for the manufacture of Lead Acid Industrial Batteries including DIN size batteries & battery plates. R & D/QUALITY CONTROL FACILITIES The factory is equipped with a chemical laboratory for In Process Chemical Analysis & Testing as well as In Coming Inspection . The laboratory is fully equipped with Optical Emission Spectrometer of "Spectro" Germany make for analysis of Lead Alloy Composition, and equipment such as Spectrophotometer, Separator Resistance Testing Equipment, Battery Container High Voltage Testing Equipment etc. In order to ascertain the Electrical Performance of the Batteries, the factory has its own fully computerized Electrical Testing Laboratory. We offer our products under brand names Jumbo, Germania etc.